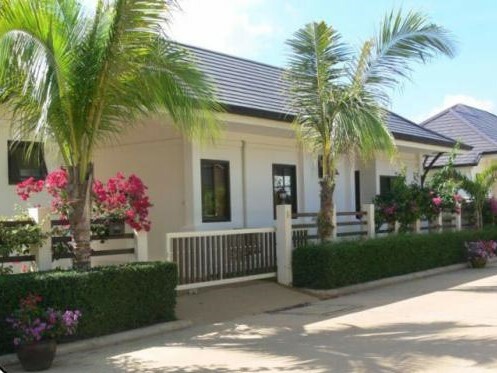 This new 3 bedroom, 3 bath villa is on Soi 156 near the fishing village of Khao Tao, about 15 km south of downtown Hua Hin. It is located in the quiet Heights II Village. A secure, friendly community about five minutes from undeveloped Suan Son and Sai Noi beaches and is about thirty minutes from Sam Roi Yod National Park. The interior is bright, airy and is tastefully and comfortably furnished, decorated in a traditional Thai style. All rooms have large sliding glass doors that face the terrace garden and swimming pool. It has ceiling fans and aircon in all rooms and central hot water to all taps. The baths are marble and the floors and counters are granite while the master bath has a large teak wood bath tub. All bedrooms have king beds with quality, comfortable mattresses. There is a laundry room with washer and dryer. Attached covered parking is included and the landscaped grounds are well maintained. The fully furnished kitchen is modern and the living room has a fine leather sofa. There is a pleasant furnished covered terrace and a large teak yard swing under the mango tree. Minimum long term 3 months.